George created this amazing piece of art for Wizard: The Guide To Comics for its Last Man Standing feature. 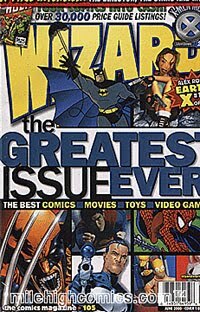 Appearing in Wizard #105 it featured these two super-teams squaring off in the ultimate "what if" battle in an issue of Wizard devoted to the Greatest things in Comics. This 19-by-19 inch masterpiece, both inked and penciled by George himself, features 25 members of each team about to square, and this is one of the few pieces that will be made available once the series comes out this summer. Also included in this original artwork selection are two concept drawings, one of the original proposal to Wizard, the second the final layout as approved by the Wizard design staff that was used as a template for the final piece you see in its colored form here. Notes: The actual piece of art that the winning bid will receive is not colored! The art is currently framed and matted with both sketches. With the mini-series just months away we decided to give you our version of what the titanic tussle known as JLA/Avengers would entail (try saying that five times fast). Last Man Standing Presents: JLA vs Avengers! THE PLAYERS... Truly the World�s Greatest Superheroes, the JLA will stop at nothing to right the world�s wrongs. While the roster may constantly changeth, the cause forever stays the course. They are Earth�s mightiest heroes: The Avengers. THE BATTLE... Welcome to World War III. With millions of lives in the balance, the JLA and Avengers face off in the ultimate showdown. Following a rousing cry of �Avengers Assemble!,� Earth�s Mightiest Heroes prepare for battle. As Captain America sizes up his counterpart Batman, he barks out orders to his fellow Avengers. Thor, not missing a beat, hurls his enchanted hammer Mjolnir at Superman, knocking him clear of the battle. The Odinson chases down the Last Son of Krypton, starting an epic battle of their own which ends with the Asgardian victorious� barely. Meanwhile, just as Firestorm turns Cap�s shield into cotton candy, Quasar bursts in to give the element-arranger a serious pounding. And the heroes continue to fall. Wonder Woman trounces She-Hulk. Namor snags Aquaman�s harpoon as his prize. The Flash runs rings around Quicksilver. And the battle continues. Orion and Big Barda almost reach their limit as Goliath and Hercules fall. Green Arrow and Zatanna drop before Hawkeye and Scarlet Witch. Iron Man�s energy (and experience) knocks Green Lantern out. And when the dust finally settles, there stands Captain America, Iron Man and Thor, facing Batman, Captain Marvel, Martian Manhunter, Wonder Woman, Orion and Big Barda. And while the battle continues to rage on for hours, the Avengers ultimately collapse before the sheer might of the World�s Greatest Superheroes: the JLA. Superman vs. Thor, Batman vs. Captain America, Wonder Woman vs. She-Hulk, Big Barda vs. Hercules, Fire vs. Firestar, Red Tornado vs. Justice, Martian Manhunter vs. Vision, Hawkman vs. Falcon, Firestorm vs. Quasar, Steel vs. Triathalon, Black Canary vs. Black Widow, Blue Beetle vs. Black Panther, Namor vs. Aquaman, Green Lantern vs. Iron Man, Orion vs. Giant-Man, Huntress vs. Tigra, Captain Marvel vs. Wonder Man, Plastic Man vs. Machine Man, Power Girl vs. Warbird, Ice vs Crystal, Flash vs. Quicksilver, Zatanna vs. Scarlet Witch, Green Arrow vs. Hawkeye, Vixen vs. Beast, Atom vs. Wasp. "The battle...Welcome to World War III. With millions of lives in the balance, the JLA and Avengers face off in the ultimate showdown. Following a rousing cry of "Avengers Assemble! ", Earth's Mightiest Heroes prepare for battle. As Captain America sizes up his counterpart Batman, he barks out orders to his fellow Avengers. Thor, not missing a beat, hurls his enchanted hammer Mjolnir at Superman, knocking him clear of the battle. The Odinson chases down the Last Son of Krypton, starting an epic battle of their own which ends with the Asgardian victorious...barely. Meanwhile, just as Firestorm turns Cap's shield into cotton candy, Quasar bursts in to give the element-arranger a serious pounding. And the heroes continue to fall. Wonder Woman trounces She-Hulk. Namor snags Aquaman's harpoon as his prize. The Flash runs rings around Quicksilver. And the battle continues. Orion and Big Barda almost reach their limit as Goliath and Hercules fall. Green Arrow and Zatanna drop before Hawkeye and Scarlet Witch. Iron Man's energy (and experience) knocks Green Lantern out. And when the dust finally settles, there stands Captain America, Iron Man and Thor, facing Batman, Captain Marvel, Martian Manhunter, Wonder Woman, Orion and Big Barda. And while the battle continues to rage on for hours, the Avengers ultimately collapse before the sheer might of the World's Greatest Superheroes: the JLA". George P�rez will take an ocean voyage to Scandinavia this summer...paid for by his maiden voyage into the world of online auctions. The "ultimate George P�rez fan collector piece," a spread depicting a battle between the Justice League of America and the Mighty Avengers, sold on the eBay auction site [www.ebay.com] in May for a whopping $6,302. "I was stunned," P�rez said of the results. "I�m quite pleased." The online battle for the art, which appeared in the "Last Man Standing" feature in Wizard #105, was just as heated as the epic conflict depicted in P�rez�s pencils. Twelve bidders went head to head over the piece during the week-long auction, tossing out a total of 35 bids. Eventual champion Scott Isaacson delivered the winning bid just nine minutes prior to the auction�s close. So what possessed him to fork over six grand for a piece of artwork? "I�m crazy," he laughed. "This is a once-in-a-lifetime chance... It�s just so unique." Isaacson, who was the first person to bid on the art, paid close attention to the auction�s status--even more so than P�rez. The artist admitted he checked on the auction�s status from time to time, but said such efforts were basically unnecessary: "I had so many people calling me and updating me on it...Most people were quite astounded." Sure, $6,302 is more than the average P�rez groupie can afford, but the piece is definitely worth it. In addition to its obvious value as a George P�rez original, the artwork may just mark the last time fans get to see the JLA face off against the Avengers. "I can�t imagine they�ll ever get that book together," P�rez said. "They�ve had ample opportunity...if they didn�t try to seriously act upon it during the time when JLA and Avengers are at their hottest, I can�t see any other time they�re going to do it." Artist Joe Jusko hopes to duplicate P�rez�s eBay success. Working in conjunction with Wizard, the renowned artist will auction the Sabretooth, Mystique and Professor X covers he painted for Wizard: The Comics Magazine. The three pieces will go up for auction sequentially, with the first one beginning Monday, June 26. Nearly 20 years ago, George Pérez started work on what could have been one of the legendary comic battles of all-time: The Justice League of America versus The Mighty Avengers. But due to company politics between DC and Marvel, the project was killed, and never saw the light of day. Pérez went back to the drawing board one last time for Wizard #105, The Greatest Issue ever, and created one of the most memorable Last Man Standings ever with the two teams pairing off in classic Pérez fashion. To further defuse one of the comicdom’s most egregious oversights, Wizard has joined forces with Pérez and is auctioning off this one-of-a-kind piece of original art on E-Bay as you read this. The 19-by-19 inch masterpiece, both inked and penciled by Pérez, features 25 members of each team about to square of, and is the last time he will ever draw these two teams together. Also offered on E-bay as part of the package are two concept drawings by Pérez, one of the original proposal to Wizard, the second the final layout as approved by the Wizard design staff, which was used as a template for the final piece you see in its colored form here. Quite simply, this is the ultimate George P�rez fan collector piece. Nearly 20 years ago, George started work on what could have been one of the legendary comic battles of all-time, the ultimate conflict that fans are still been waiting for: The Justice League of America versus The Mighty Avengers. But due to comic book company politics, the project was killed and never saw the light of day. And now Wizard Entertainment is proud to partner with George P�rez himself to auction this original comic book art collectors dream off, so someone can own this amazing, original piece of art in its un-colored form, and be a part of comic book history. This 19-by-19 inch masterpiece, both inked and penciled by George himself, features 25 members of each team about to square, and this is the last time George will ever draw these two teams together. Also included in this original artwork selection are two concept drawings, one of the original proposal to Wizard, the second the final layout as approved by the Wizard design staff that was used as a template for the final piece you see in its colored form here. 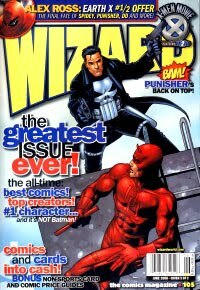 Wizard #105 includes an article on Gorilla Comics and new artwork by George Perez ("Last Team Standing"). The new piece will be auctioned off on E-bay.com starting May 15th. In related news, here are some of George Perez's artwork that have been missed in Wizard #104.